Abstract. Various forms of geoengineering have been proposed to counter anthropogenic climate change. Methods which aim to modify the Earth's energy balance by reducing insolation are often subsumed under the term solar radiation management (SRM). 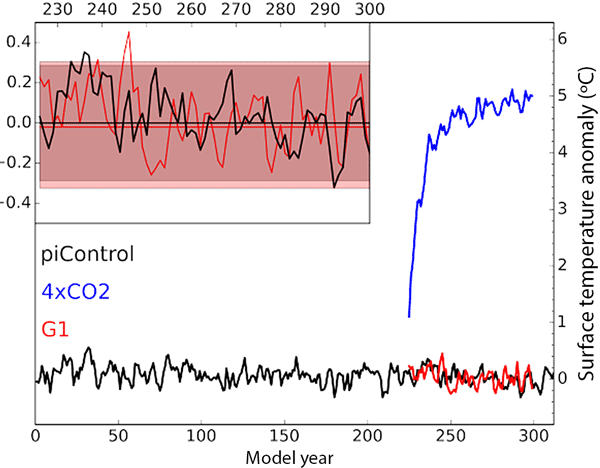 Here, we present results of a standard SRM modelling experiment in which the incoming solar irradiance is reduced to offset the global mean warming induced by a quadrupling of atmospheric carbon dioxide. For the first time in an atmosphere–ocean coupled climate model, we include atmospheric composition feedbacks for this experiment. While the SRM scheme considered here could offset greenhouse gas induced global mean surface warming, it leads to important changes in atmospheric composition. We find large stratospheric ozone increases that induce significant reductions in surface UV-B irradiance, which would have implications for vitamin D production. In addition, the higher stratospheric ozone levels lead to decreased ozone photolysis in the troposphere. 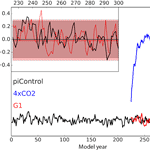 In combination with lower atmospheric specific humidity under SRM, this results in overall surface ozone concentration increases in the idealized G1 experiment. Both UV-B and surface ozone changes are important for human health. We therefore highlight that both stratospheric and tropospheric ozone changes must be considered in the assessment of any SRM scheme, due to their important roles in regulating UV exposure and air quality. How to cite: Nowack, P. J., Abraham, N. L., Braesicke, P., and Pyle, J. A.: Stratospheric ozone changes under solar geoengineering: implications for UV exposure and air quality, Atmos. Chem. Phys., 16, 4191-4203, https://doi.org/10.5194/acp-16-4191-2016, 2016.